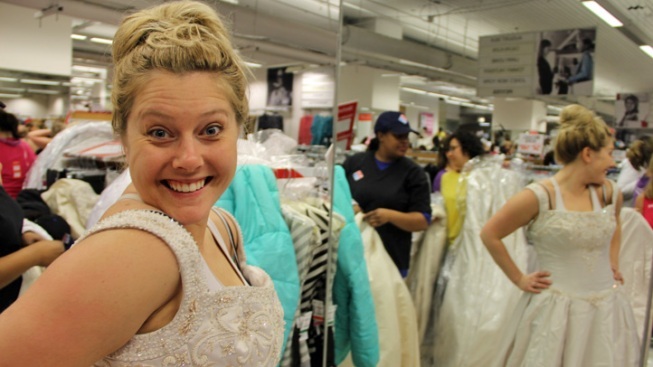 The Running of the Brides is Filene's Basement's most popular annual event. It looks like the brides will have to find a new place to run. Filene's Basement filed for bankruptcy protection Wednesday and plans to close all 46 of its stores. Filene's has two locations in Illinois, both in Chicago, at 830 N. Michigan Avenue and 1 North State Street. Filene's Basement's parent company, Syms, acquired the stores out of bankruptcy protection two years ago, but wasn't able to turn the chain around. Most of the stores are located in the Eastern portion of the country. Filene's Basement has been around since 1909 and was created as a place for the Filene's department store to sell excess merchandise. It's best known for the "Running of the Brides" sales event, where eager brides-to-be wait in line for hours for a chance at buying deeply discounted bridal gowns. The liquidation is anticipated to run through about January.